Go to the drawers and take two maps, one from each drawer. Note China highlighted in one map and US highlighted in other map. Read the sign besides the door. Click above the door, remove a brick and take the note. Read the note. Go to the shelf and click on the relevant book. Read the book. 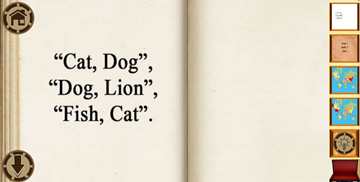 Go to the screen and enter the animals as given in the book. Row 1 = Cat Dog Dog, Row 2 = Lion Fish Cat. Another puzzle shows up: Answer is US and China. A code shows up that is to be entered to open the door = 99. ​Proceed to the next level!